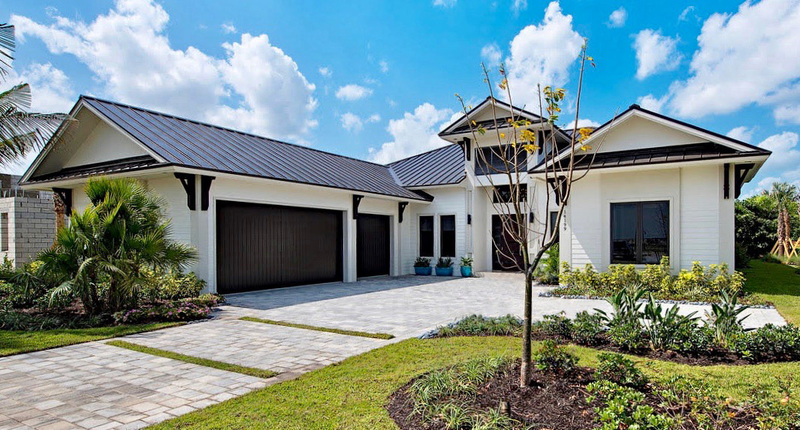 KTS Homes’ newest model, the Newport II, located in the exclusive custom-designed neighborhood of Parrot Cay in Naples Reserve, is completed and designer-ready, meaning prospective buyers may choose certain design finish options, making it a true custom home. From the covered entry, you step into the foyer. Straight ahead is the 27- by 22-foot large open concept great room. Separating it from the outdoor living area is a seamless Solar Innovations’ impact-rated 10-foot glass pocketing door, which from the center, layer back onto themselves. To the right of the great room is the open gourmet kitchen with island counter with sink and breakfast bar. Adjacent to the kitchen is the formal dining room. It has sliding glass doors that retract back in two directions, opening the dining/kitchen area to the outdoor living area, perfect for entertaining. Nearby are two guest bedrooms, each with their own bathroom. The powder bath is also located in this area. To the left of the foyer is the study, which has a set of French doors and overlooks the front of the home. Just past the study is the very private master suite. The bedroom itself measures 18 by 16 feet and has direct access to the pool via walls of sliding glass that also retract back in two directions. The master bath features his and her vanities, a free-standing soaking tub, an oversized walk-in shower, and a private water closet. Beyond the master bath is the 13- by 11-foot walk-in closet. For the ultimate in convenience, it has access to the laundry room which features a built-in utility sink. In addition to the pool with a wet shelf, spa and fire pit, the rear exterior of the Newport II features an under-roof outdoor living area and outdoor kitchen with cabinets, a built-in gas grill, under-cabinet refrigerator and a stainless steel sink. Visitors to the Newport II are also welcome to tour KTS Homes’ award-winning Newport model, which is completed and furnished just a few homesites away. The Newport floor plan is very similar in layout to the Newport II, with only a few exceptions. Naples Reserve is a 688-acre community featuring a lakefront lifestyle and Southern Coastal-inspired homes. The furnished Newport model is open Monday thru Sunday. Once past the gatehouse, turn left on Naples Reserve Circle, take first right into Parrot Cay, followed by another right turn on Charthouse Circle. The Newport model is the first home on the right side. For more information on the Newport models in Naples Reserve or KTS Homes, visit ktshomesnaplesreserve.com.